There are so many libraries, for instance for C# networking or Java encryption. I am looking for data about the "popularity" of published libraries. Bonus if the data is easily searchable using a web browser. Github is the de facto internet repository for open source code. They've released source code data from packages hosted on this site (press release, blog post with examples). This 3TB+ dataset comprises the largest released source of GitHub activity to date. 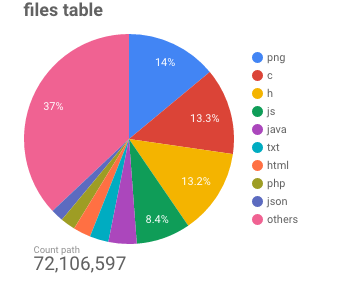 It contains a full snapshot of the content of more than 2.8 million open source GitHub repositories including more than 145 million unique commits, over 2 billion different file paths, and the contents of the latest revision for 163 million files, all of which are searchable with regular expressions. Don’t analyze the main [bigquery-public-data:github_repos.contents] table — at 1.5 TB, it will instantly consume your monthly free terabyte. Use instead the official [bigquery-public-data:github_repos.sample_contents] extract (~23 GB), or one of the full language tables I left at [fh-bigquery:github_extracts.contents_*]. Obviously, you have to divide the number of downloads by the duration the library has been available (date column) and consider that people continue downloading old libraries, especially when they are more stable. Not the answer you're looking for? Browse other questions tagged data-request programming software or ask your own question.